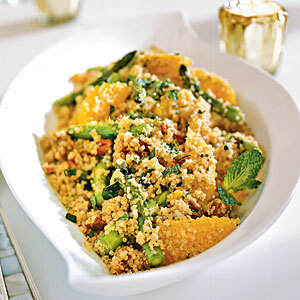 Photo of quinoa salad from original Cooking Light recipe. Getting together with friends and family is a good excuse to eat well. Here’s a simple salad recipe that can survive post-meal lack of attention on the dining table or picnic buffet. The original recipe is fairly different, which just shows that this salad is highly modifiable and you don’t need to worry about exact measurements. Adjust everything to your tastes. Toss all ingredients together, adding lettuce and almonds just before serving. 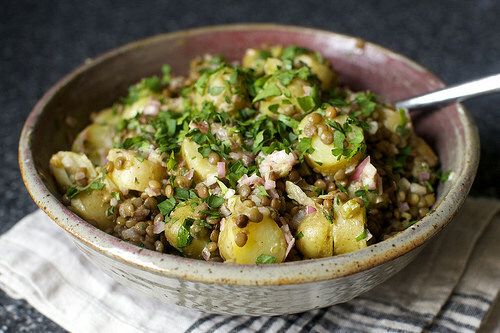 Makes 10-12 generous servings as a side dish and is good on day two. Simply halve all ingredients for a smaller salad. Wash and trim ends from the radishes, then use a food processor or grater to shred them. Put the radish in a colander and sprinkle liberally with salt, then let it rest; after 10 minutes, rinse the radish with water and then press the liquid out—this process takes away the vegetable’s bite. 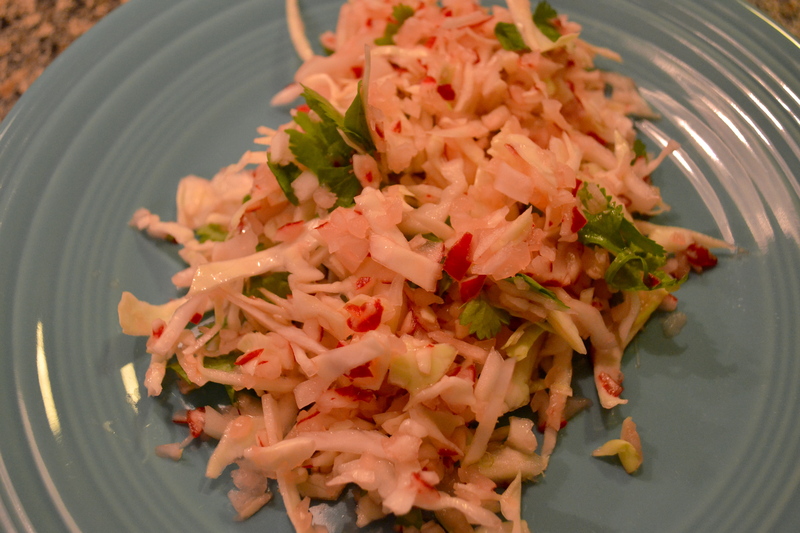 Use a food processor or a knife to slice half the cabbage into thin, bite-size pieces. Toss with the radish, cilantro and lime juice. Add more cabbage if you want. Season to taste with salt and pepper. Use a food processor or a knife to slice the cabbage into thin, bite-size pieces. Peel and trim the ends of the carrots and use a food processor or grater to shred them. Whisk together mayonnaise, vinegar and sugar, then add to cabbage and carrots. Season to taste with salt and pepper. Although I hesitate to call anything foolproof, this recipe is so easy and flexible that even a recipe-dependent cook like me can make it without a recipe. The salad improves after a night in the refrigerator. This salad is the soup of my spring: mostly veggies, done in a large batch for multiple meals ready to eat. The recipe was posted by the friend of a friend who recently started blogging about food, and the version below shows my modifications. 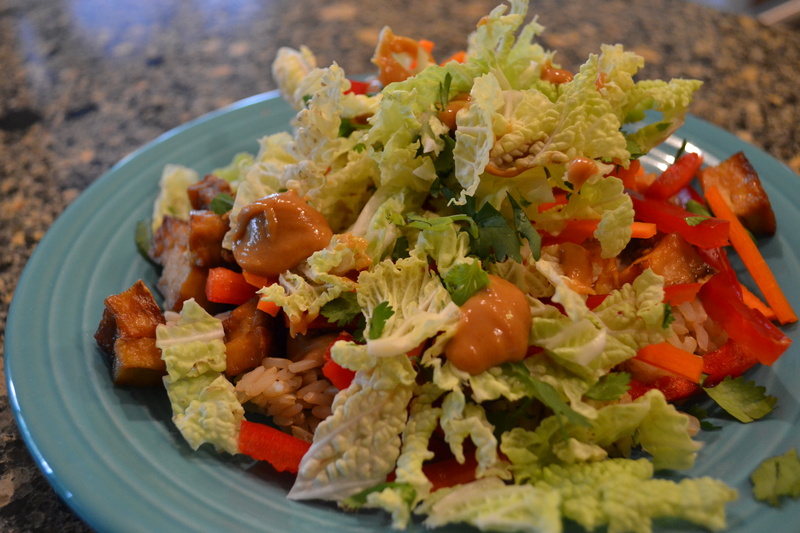 The way I’ve been making it, the peanut sauce is too thick to drizzle over the salad and I end up adding it in dollops. This in no way diminishes the deliciousness of the salad, which unites warm and cool, nutty and tangy and salty and sweet, and chewy and crunchy. You may, in fact, want to make extra peanut sauce, in which case you should consult the original Have Some recipe and make your increases accordingly. If you’ve been wondering about sprouted tofu, here’s a quick overview. If you store cooked rice in the refrigerator, stop. Refrigerators dry rice out, so leave the cooked rice in the rice cooker (unplugged) for up to two days. Where I live, we typically endure five months of winter (this year, harsh and unrelenting and over-the-edge-pushing winter), followed by what feels like two weeks of spring. At that point I am usually caught feeling unprepared to put away my parka (which most closely resembles a sleeping bag) and wear more revealing clothing. That’s a whole lot of build-up to say that I’m trying to plan ahead this year by switching now from high calorie lasagna and cauliflower tart to lighter fare. And, just in time, Real Simple magazine has offered some suggestions for fancy salads which they more accurately call one-bowl meals. The magazine shows five one-bowl meals, but makes the point that it’s “real simple” to get creative by mixing and matching from a starter list of healthy ingredients that includes grains, greens, proteins, vegetables and herbs, cheese, and “wild cards” like olives and nuts. Everything can be prepped in advance and combined later for a simple, fresh-tasting meal. In case you are like me and have a sad history of not using greens before they turn slimy and foul (despite reading many times about how to avoid just that situation), here’s what is working for me: I wash and dry the greens as soon as I buy them and put them in an airtight container. That way they’re ready to use (no excuses!) and stay fresh for about five days. Finding a good dressing has also been an obstacle to me eating more salad. Most bottled dressings have strange preservatives, including too much salt and/or sugar. Salad Girl dressings (made in my home state of Minnesota) taste good and have only recognizable ingredients, but I really just need to start making my own basic vinaigrette. If you have a favorite homemade dressing recipe, please share it here! There haven’t been any food-related posts for awhile because I fell back into my old patterns. I ended up throwing out some rotten vegetables purchased with the best of intentions, and eating a bunch of junk that was quick and overpriced and, in some cases, made me feel worse not better. So I’m glad to be moving beyond worthy excuses (the holidays, work deadlines, suspected norovirus, and a lingering weather phenomenon called the polar vortex) and starting to cook again. Note: before the holidays I wondered if I should make an effort to find and post recipes that don’t take a lot of time to prepare and don’t require what sound to me like “fancy” ingredients (capers? cornichons?). However, I’ve realized that part of what motivates me to cook is the opportunity to try new things (such as capers and cornichons), and that investing time in preparing something that reheats well is worth the effort. I’ll continue posting recipes that I have enjoyed making and eating—using Pinterest so you can see the original recipe and picture along with my comments—and you can of course ignore whatever is not useful to you.